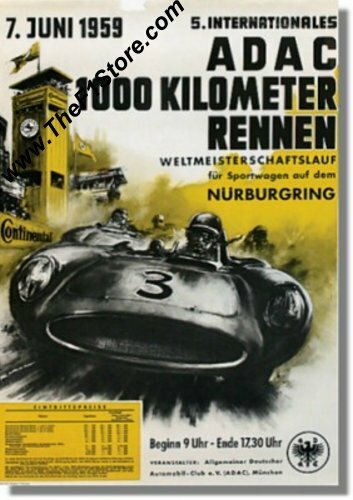 Vintage 1959 Nürburgring 1000 KM Rennen Poster. Excellent condition for its age with a small part missing at the top. Great artwork of a Ferrari "leading the pack". It measures approximately 83.5 x 59.5 cm or 33 x 24 inches. 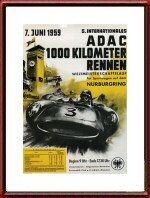 The race was won by Stirling Moss & Jack Fairman on Aston Martin DBR1/300 (S/N 1) in 7 Hours, 33 Minutes and 18 seconds. Scarce and of course only one (1) available.